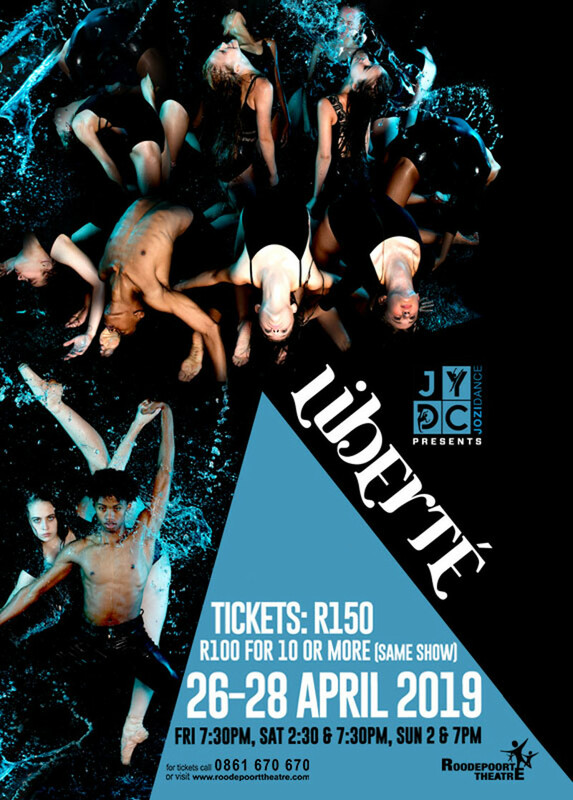 Jozi Youth Dance Company (JYDC), brings you their 5th annual production called Liberté, from 26 – 28 April 2019 at the Roodepoort Theatre. Jozi Youth Dance Company is a one of its kind, platform for young dancers, exposing them to professional choreographers and dancers. They gain invaluable experience, performing to sold out audiences, preparing them for the cut-throat dance industry. This is JYDC’s 5th season and promises to be one of their best yet. This year we present to you “Liberté” (translated from French, meaning “Freedom”). We invite you to come and watch the ultimate form of freedom in JOZI Youth Dance Company’s enthralling season “Liberté” on Freedom day. A celebration of our country, our dancers and our freedom. Over the past 5 years, JYDC have welcomed young dancers from all over Gauteng in order to give them a platform to showcase their talent and inspire the next generation of professional dancers. Under the directorship of Jayd Swart, the company has grown, not only in number but also quality of dance. “Young dancers need to be given the opportunity to show what they are capable of. We train them in both technique and expression and motivate them to achieve new heights while preparing them for a future in dance” said Swart. Liberté, the largest and most spectacular of shows produced by JYDC is guaranteed to set the stage on fire. “This year, we have the most magnificent lineup of choreographers, each bringing their own distinct personality to the stage” said Swart. Choreographers include, Adele Blank, world renowned choreographer and dance instructor, Veronique Rabe, professional dancer, choreographer and actress, Evan Van Soest, professional dancer and choreographer, Charlie Van Rooyen, professional dancer, choreographer and actor, Cayley Hodson, resident choreographer of JYDC, Joanna De Silva, up and coming Choreographer and Jayd Swart herself who is a well-established international contemporary dance choreographer and ballet trainer and coach. And in true JYDC nature students, Luca Redfern and Navin Jacobs, have been afforded the opportunity to choreograph the student piece, also to be showcased in Liberté. JYDC has opened up many doors for company members including a training tour to South-Korea, Romania, Bulgaria, Portugal, USA & Croatia. This year, the production forms part of the Grahamstown National Arts Festival line-up and a Cape Town Tour has also been scheduled to show case this wonderful production. Out of our 1st group of graduates all 4 graduates have received jobs within the industry, both nationally and internationally. We are so proud to be developing this kind of talent within the South African Dance Industry.